Trees arrive in the urban forest in many ways. Some are planted by wildlife like squirrels or birds. Some seeds arrive on the wind and find a nice place to sprout along a fence line. Most trees in the urban forest are planted by people. Proper planting technique and thoughtful consideration to species will help your planted tree thrive. There are many factors to take into consideration prior to purchasing your tree. The right tree for the right location is the most important consideration when choosing a tree. Where will the tree be planted? What qualities should the soil have? What will surround the planting site? What kind of light should the site receive? Is the site exposed to harsh conditions, like wind, salt spray, or compaction? Soil type is important if you want your tree to be successful. You can read our blog post on soil for more information. Make sure you have a tree that tolerates dry conditions for a dry site or wet conditions for a wet site. Proper site conditions will drastically increase the chances of your tree being happy and growing to maturity. Light levels are also very important for the growth of a new tree. Trees like Sugar Maple do better when they are young if they are protected from afternoon sun in the late winter. Sugar Maples in the open can suffer from sun scald and be left with an open wound on the southwest side of the trunk. Alternatively, trees like Juniper will grow thin and spindly in the shade. Choosing an appropriate species for the light levels available at your planting site should be a priority. 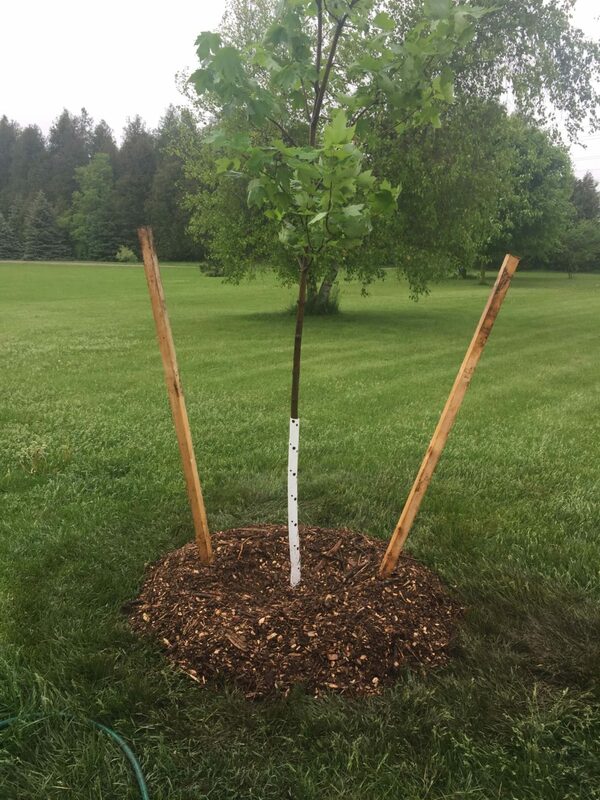 It is important to plant a tree that is the appropriate size for the planting site. The most common issue that we see is that people forget to look up when they plant a tree and end up with a tree growing into hydro lines or phone lines. If you have a planting spot that has wires above it, choose a small tree like Serviceberry or Red Bud. Make sure you give your tree enough space to grow — especially if your tree will become very large when it is mature. Choose well when planting to limit your maintenance costs over the lifetime of the tree. There are many beautiful species of trees that are native to Ontario. Trees that are native to your region have evolved with the local climate and pests and will do much better that a tree from somewhere else. Certain trees like Norway Maple (and all of its varieties like Crimson King) have actually become an invasive problem in parts of Ontario. The Don Valley in Toronto has become a forest of thick Norway Maple, limiting diversity in the understory. Some trees are more tolerant to harsh conditions than others. Certain conditions like road salt spray or heavy compaction (as in most new subdivisions) can limit your choices for planting. Dig a hole that is slightly more shallow that the root ball of the tree. You want the top inch of the soil from the potted tree to be above the soil level around it. We say, “plant proud” to help remember this trick! Over time, the tree will settle and this will prevent the tree from being too deep later on. Dig the hole to be 2-3 times wider than the root ball to allow for the roots to spread in loose friable soil. If the tree was in a pot, break up the roots to encourage them to spread out. If you just drop the root ball into the hole (as it was in the pot), the roots will continue to grow as if they are in a pot. Over the years, this can be an issue as some of the roots may end up girdling the tree. Add a soil amendment like bone meal (for root growth) or MYKE. We like to use MYKE because it contains mycorrhizae that attach to the roots of the tree and help them use more water and nutrients from the surrounding soil. The mycorrhizae and the roots have a symbiotic relationship. Back fill the soil and gently press in with your hands. WATER IN YOUR TREE. Do not skip this step! Watering the tree in at the time of planting greatly improves outcomes. Mulch around the tree to prevent weeds from competing with your newly planted tree. Mulching will keep moisture and nutrients around the root ball of your tree. Mulch also helps deter mechanical damage from lawn mowers, as it creates a buffer area when the mower doesn’t need to pass by the tree. When mulching, remember “donuts not volcanoes”. Do not let mulch pile up too high around the trunk, as it can encourage decay and root problems. Stake if necessary. Use wooden stakes and arbor tie over wire and t-bars to keep the tree growing upwards. Be sure to remove the stake material the following year, so the tree can get used to standing up for itself in the wind. Water regularly and water deeply. To water effectively, you need to let the water penetrate the soil over the entire root zone. Light watering only waters the top inch of soil. You need to water gently for a long period of time. We suggest you put the hose on a slow stream that is not strong enough to wash away the soil and let is sit for at least half an hour. Move the hose around the trees root zone a few times. Alternatively use a watering bag which can be found at many different garden stores these days. 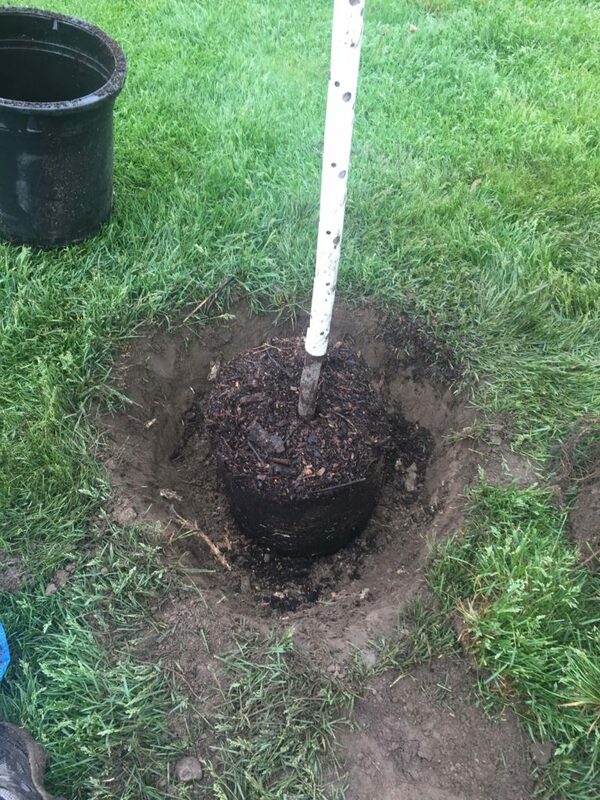 Newly planted trees need time to establish their roots. Regular watering (especially during drought) is essential. Prune for structure the second or third season. See our small tree pruning blog for details.